Firstly, you will know this home remedy and it is extremely important Water, H20, get in the habit of drinking at least 8 glasses of water a day, it is very easy to do. Have a glass in the morning to kick start your day. Then keep a bottle of beside you through out the day and you will be surprised how many times you will refill the bottle. I stopped smoking, instead of reaching for a cigarette I take a sip of water. Next, by just eating the right foods you will not only make your skin look great, you will feel great on the inside. Vitamins A C And E are great for your skin, which can be found in fruit and veg. Oranges, strawberries and any berry's are high in anti oxidants and vitamins. Oily fish, sardines, mackerel any fish is great for you. Olive oil, Just brilliant home remedy for wrinkles. Drizzle on salads, also mix brown sugar and olive oil to make a scrub for your skin, this can be used on the face to get rid of dead skin cells and give your skin a stunning glow, great for the inside and outside of the skin. Lemon Juice, rubbing the skin with lemon juice is a highly effective method to reduce blemishes on the skin. Pineapple is also a great home remedy for wrinkles, rub the core of the pine apple and leave on the skin for 5 minutes to give your skin a refreshing glow. A tried and tested home remedy for wrinkles is mix rose water, glycerin and lime juice in equal parts , leave on the face over night, wash off with lukewarm water in the morning. Coconut oil massaged on the face each night before bed is a great home remedy for wrinkles, which makes the skin feel so soft and glowing like a baby's skin. 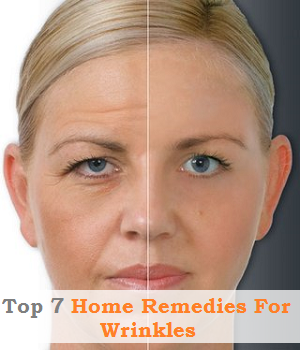 These are tried and tested home remedies for wrinkles, they are very effective.